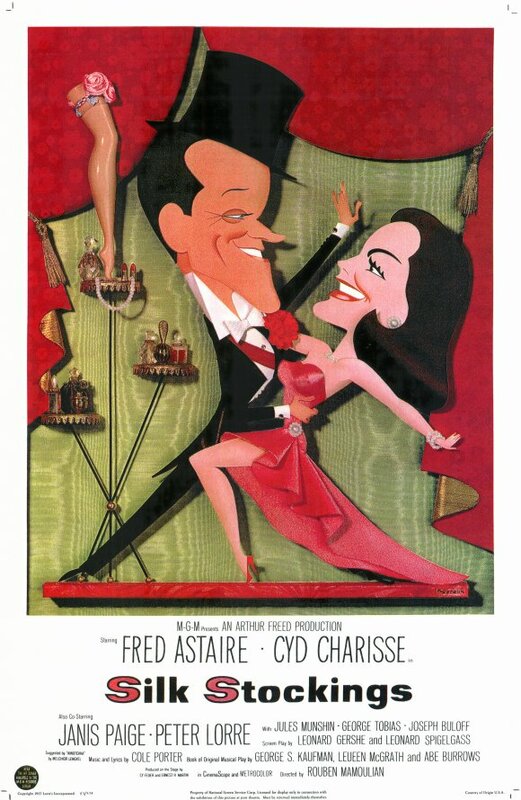 When three bumbling Soviet commissars (Peter Lorre, Jules Munshin, and Joseph Buloff) fail to convince a composer (Wim Sonneveld) to return from Paris to Russia, a hard-nosed female agent (Cyd Charisse) is sent to investigate the situation — but she soon finds herself falling for the suave producer (Fred Astaire) of the musical production Sonneveld is involved with. This musical version of Ernst Lubitsch’s Ninotchka (1939), based on a 1955 Broadway production with music by Cole Porter, is an unfortunate misfire on most accounts. While Lubitsch’s comedy effectively incorporated an unconventional romance into a boldly satirical skewering of early Communist Russia, this unfunny Cold War-era remake simply feels stale. It’s embarrassing enough to see Lorre reduced to playing such a silly part, but poor Charisse fares even worse; her wooden performance can’t help evoking consistently unkind comparisons to Garbo. On the plus side, there’s plenty of Charisse’s incomparable dancing to enjoy: her “Silk Stockings” solo is a highlight, as are her performances with Astaire (“Fated to Be Mated”) and the rest of the cast (“Red Blues”). Also adding to the film’s enjoyment is a spirited performance by Janis Paige as “Peggy Dayton”, whose character — “America’s swimming sweetheart” — was obviously modeled after Esther Williams; her “Stereophonic Sound” duet with Astaire is especially fun and lively. However, while those enamored with Charisse’s uniquely fluid cinematic dancing style will clearly want to check this one out, others needn’t bother. No; this one is only must-see for musical fanatics. A once-must, as an accomplished film version of Cole Porter’s last long-running Broadway musical. I’m not sure that it’s fair, in this case, to compare a musical with what it’s based on. I haven’t seen ‘Ninotchka’ in quite a long time – though I will probably revisit it soon. Perhaps since that’s the case, I may have some real distance from it that has let me appreciate ‘Silk Stockings’ (on this revisit) on its own terms. Of course, that wouldn’t matter at all if ‘SS’ just came off to me as wretched (or inferior) no matter what. But I don’t feel that way. In fact, I was quite charmed by a work that I feel accomplishes what it sets out to do: re-invent ‘Ninotchka’ with songs. Rouben Mamoulian (who, of course, directed Garbo in ‘Queen Christina’, so knew her spirit) turned out to be a fine choice to direct. The hard-working cast seems to be enjoying themselves immensely and their comic timing is fine. All of the musical numbers are inventive and interesting to watch. Porter’s score is memorable – it’s presented and performed impeccably. So, personally, I don’t see any reason to complain. I find it a very enjoyable film. Granted, when you boil it down to basics, there’s nothing particularly unique about the central love angle, but that’s of little concern. Astaire and Charisse are a dream team and it’s enough to just watch them together. To me, Charisse acquits herself nicely in her ‘tough act to follow’ role – and, if she’s not Garbo, I have no trouble buying into her interpretation of the character. Astaire is…well, Astaire – and, here, doing a marvelous job of that. All told, ‘SS’ is a solid film musical and very much worth a watch.